Overall siz: 19" x 23"
P-40L Warhawks of the 325th FG commanded by Lt.Col. 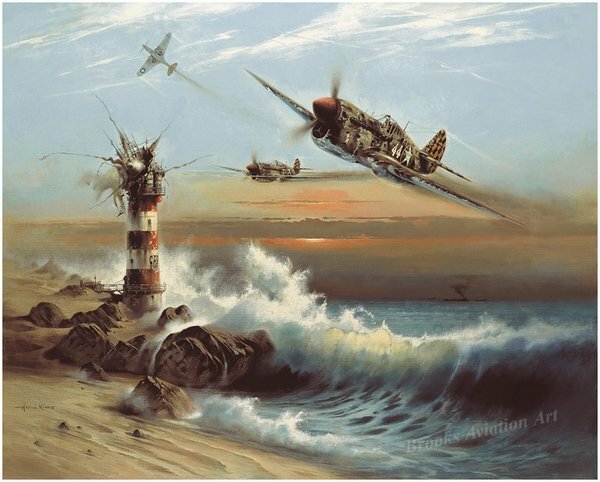 Gordon H. Austin, attack a lighthouse on the North African coastline in early 1943. Lighthouses became a common target of the Checkertail Clan, as there had been reports indicating that they were being used by the Germans as observation posts for early warning of approaching Allied forces. Gordon named his P-40 Lighthouse Louie.